Once natural gas is extracted, it must be transported to different places to be processed, stored, and then finally delivered to the end consumer Canadian Energy Pipeline Association (CEPA). « Natural Gas Pipelines ». http://www.cepa.com/about-pipelines/types-of-pipelines/natural-gas-pipelines Canadian Energy Pipeline Association (CEPA). « Natural Gas Pipelines ». http://www.cepa.com/about-pipelines/types-of-pipelines/natural-gas-pipelines Canadian Energy Pipeline Association (CEPA). « Natural Gas Pipelines ». http://www.cepa.com/about-pipelines/types-of-pipelines/natural-gas-pipelines . Natural gas can be transported on land via pipeline or on water via ship. Gathering pipeline system - the gathering system includes low pressure small pipelines that transport raw natural gas from the wellhead to the processing plant. Intrastate/interstate pipeline system - Pipelines can be classified as intrastate or interstate. Their technical and operational characteristics are substantially similar, and they both have the same goal: to transport natural gas from the processing plant to the centers of its consumption. 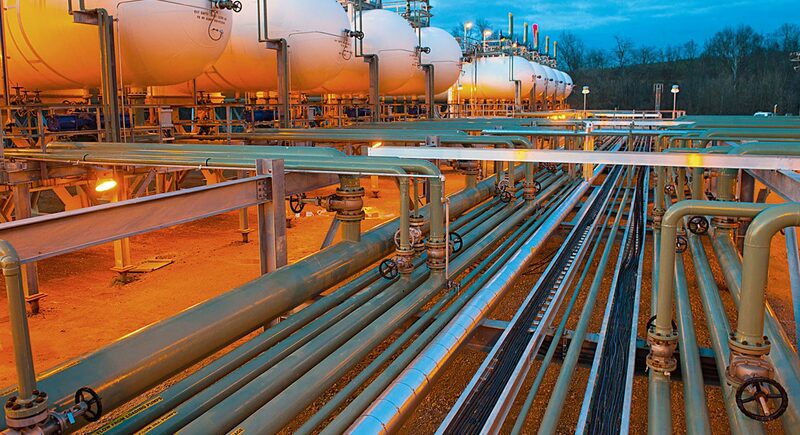 Distribution pipeline system - the distribution pipeline system has the purpose of delivering gas to the end-consumers. Natural gas must be highly pressurized to move it along the pipeline. To ensure that the natural gas remains pressurized, compressor stations are placed in intervals along the pipeline. The natural gas enters the compressor station, where it is compressed by either a turbine, motor, or engine. Metering stations are also installed throughout the pipeline network to monitor for pressure, flow and leaks. Where natural gas cannot be delivered on land, it can be liquefied and delivered by ship. Compared to gas pipelines, liquefied natural gas (LNG) shipping is preferred for international transport because, in a liquid form, natural gas takes up less volume, making it easier for shipment and storage. LNG infrastructure includes a gas pipeline leading to the seaside, gas liquefaction plant, storage facilities and an LNG terminal for shipment. After being liquified and transported to the area of demand, LNG is returned to gas form at regasification plants at the terminal. Natural gas can also be stored for later use. As natural gas is typically produced in remote regions away from areas of high gas demand, natural gas transport is a critical part of the natural gas industry Le Fevre, C., Madden, M., White, N. « LNG in transportation 2015-2035 ». October 2014. http://www.cedigaz.org/products/LNG%20in%20Transportation/lng-transportation.aspx Le Fevre, C., Madden, M., White, N. « LNG in transportation 2015-2035 ». October 2014. http://www.cedigaz.org/products/LNG%20in%20Transportation/lng-transportation.aspx Le Fevre, C., Madden, M., White, N. « LNG in transportation 2015-2035 ». October 2014. http://www.cedigaz.org/products/LNG%20in%20Transportation/lng-transportation.aspx . There are several concerns relating to natural gas transport. Leaks are a major issue. Methane is highly flammable; undetected leaks could lead to accidents and explosions. Additionally, natural gas is predominantly methane, a potent greenhouse gas. Undetected natural gas pipeline leaks could be a contributor to climate change. There are also concerns of pipelines crossing environmentally sensitive areas, for example in delicate natural habitats, near communities, and close to water aquifers. Finally, some environmentalists argue that investing in natural gas pipeline and LNG infrastructure supports dependency on fossil fuels, making natural gas less of a bridge fuel and more of a permanent source of energy. Sorry, we do not yet have a video specifically for Natural Gas Transportation. We are adding new videos to StudentEnergy.org weekly, but in the meantime check out these videos on Natural Gas and Liquefied Natural Gas. Natural Gas is a flammable gas, consisting mainly of methane (CH4), occurring in underground reservoirs often with oil.